"In tribute to an inspiring Matriarch, Artelure M. Gamble, and a much beloved Great-Aunt to our Sister Charity Smith." Mrs. Artelure Marylena Gamble, known for her faithfulness, gentleness, motherly love, and humble Christian spirit, peacefully entered into eternal life on Thursday, Jan. 19, 2017, at the Crestview Rehabilitation Center in Wynne. She was 95 years old. Artelure Gamble was born March 12, 1921, to Rev. Mark Edward Smith and Charity (Edinburg) Smith in Palestine. She was the oldest of two daughters. Her beloved sister was Ruby Lee Fleming who preceded her in death in 1999. She accepted Christ, and joined the Elcannon Missionary Baptist Church under the leadership of her father, where she began her magnificent Christian walk with the Lord. Her early training was provided by her loving parents. 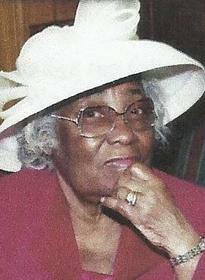 She attended grade school in the one-room Elcannon Missionary Baptist Church School. Artelure developed a love of learning, and she indicated in her memoirs that “because of her parents’ desire to better educate their children, she and her sister Ruby boarded with relatives to complete their high school education. She graduated from Lincoln High School in Forrest City with honors and enrolled at Arkansas Mechanical and Normal College (AM&N) in Pine Bluff, graduating in three years with a Bachelors of Science degree in Home Economics in 1944. Artelure was studious and continued her education at the Arkansas State University at Jonesboro, Ouachita Baptist University at Arkadelphia, Philander Smith College in Little Rock and East Arkansas Community College in Forrest City. During college, Artelure met the love of her life Elporter Gamble who was stationed in California during World War II. On Feb. 15, 1947, she was united in Holy Matrimony to Elporter. They remained happily married for 67 wonderful years. Although they had no biological children, she provided love to the children in her family, school, church and community. Elporter preceded her in death in 2014. Throughout their marriage, they never spent a day apart. Artelure Gamble dedicated her professional life to the education of children and she provided 40 years of service in the classroom, most of which was spent in Forrest City, at DeRossitt Elementary, Madison Butler Elementary, and the Diocese of Arkansas Episcopal Church at Christ Church School. As a teacher, she helped to shape the lives of boys and girls, and many of her former students have continued their education and remained in contact with her throughout years. Artelure Gamble won numerous awards including the following: Salem Baptist Church Missionary Work Award; Semper Fidelis “Lifting as We Climb Service Award; Arkansas Governor Mike Huckabee’s Marriage and Family Award; HR1688 – Honorary Citizen of Georgia and Good Will Ambassador Citation; Arkansas State Senate Citation for service to the Semper Fidelis Club, and a Forrest City School District Resolution commending her for extraordinary contribution to the lives of children. Artelure Gamble was a member of Salem Baptist Church for almost 70 years serving as Sunday School Teacher, Deaconess, Missionary Circle Chairperson, Financial Secretary, BTU instructor and Supervisor of the the youth. Additionally, she worked untiringly with the Missionary Society, Vacation Bible School and summer educational enrichment programs and wherever she was needed. She was preceded in death by her devoted husband, Elporter Gamble. She leaves to cherish her memory the children of her sister and brother-in-law, the late Walker and Ruby Fleming. They are: Dr. Helen Johnson, Leander, Texas, Lawrence Fleming (Bettye) Walker Leodis Fleming III (Charlotte) Centennial, Colo., Charles Fleming (Lillian), Cordova, Tenn., Dr. Charity Smith-Allen (Fred), Little Rock, Ruby Bridgeforth (Anthony) St. Cloud, Fla., Carolyn Hugley (Isaiah) and Everett Fleming. She also leaves to cherish her memory, niece Barbara Ann Amos, St Louis, Mo. Additionally, she is loved and remembered by a host of nieces, nephews and cousins from the Gamble, Amos, Dawson, McDaniel, Smith and Fleming families. Services will be held at Salem Missionary Baptist Church at 103 Haven Street in Forrest City, at 10 a.m., Saturday, Jan. 28, 2017. Public viewing will be Friday, Jan. 27, 2017, from 1 to 5 p.m., at Clay Funeral Home, located at 2522 E. Broadway in Forrest City. Memorial contributions may be made in lieu of flowers to Arkansas Community Foundation, P.O. Box 3002 Forrest City, AR 72336. Burial will follow at the Mark and Charity Smith Memorial Gardens in Palestine, under the direction of Clay Funeral Home.